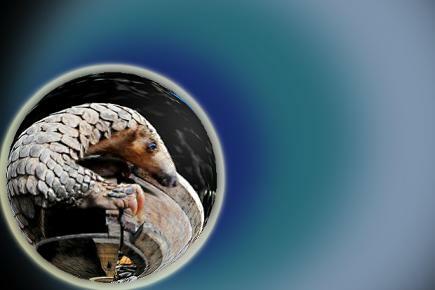 Luise Fletcher, The Carnivore and Pangolin Conservation Program. ► There’s a range or a sphere of influence that contains how much a person cares and it can be enlarged. ► The greater the spheres of care, the greater our impact. ► Pick something you care about – enlarge your spheres of care – and discover greater ways to make a difference. Can we be full-on if we don’t care? From the Service Leadership model, our success as service leaders depends on the quality of our Competence, Character and Care. Competence includes the skills and expertise we’ve built over time. Character is how trustworthy we are and how true we stay to our moral compass. Care is the subject of today’s post. To start, imagine there’s a range or a sphere of influence that covers what a person cares about. The first range or sphere covers the self. This can come from continuous learning or improving, the feelings that keep our motivation up, the desire to make money, and everything else that covers self-interest. Although self-centered, I don’t mean being selfish or an egocentric. Instead, it’s that we can succeed and do well even if we only focus on bettering ourselves in all our dimensions. From Service Leadership, this is an important part of our Care. Now imagine there’s a range or sphere of Care that covers our family, friends, team and other people who directly come into our life. At home, we can immensely strengthen our relationships simply by caring more deeply for our family and friends, and this will enhance our service leadership. At work, we can be more successful if we show deeper care for our teammates and clients. Next, imagine there’s an even larger sphere of Care that covers the whole neighborhood we live in or the organization. This care can show by bringing new programs that help everyone, like a recycling or food-composting set up, and improving the lives of people who are close but may not be directly in our social groups. Lastly, imagine there’s an expanded sphere that covers our country, region, the ecosystem and even the planet. Each sphere covers different areas of our lives, expanding from the self to the whole. What we see is that the more we expand our spheres of Care, the greater the ultimate impact of our service leadership. This builds trust and we can get more done. Want to get full-on? Start expanding your spheres of Care. In cities around the world, the issue of clean air and smog is only getting increasingly urgent. For ourselves, getting full-on can start by noticing and acting to limit the bad air we breathe. Expanding that sphere ever outward, we can see that from our families to everyone in Asia Pacific, the air we breathe must be protected. Getting full-on can mean starting a campaign at our schools or at work and enrolling more people to pressure our government to make this a priority that reserves urgent, decisive action. As we expand our spheres of Care and follow through with action, the greater our influence and impact as service leaders. Every day, fishermen around the world plunder our oceans and they are literally being turned into aquatic deserts. More often than not, how sustainable the hunt really is gets ignored. What’s a few more fish when there are dollars to be made? For ourselves, getting full-on can start by caring about how our dining choices have a direct impact on local fish consumption. Caring enough to choose sustainable alternatives, saying no to shark meat or shark fin soup, and speaking up against the fish trade is important. Expand that sphere outward and we can get more people to care about our oceans. From writing articles to getting a group together to choose sustainable seafood – these are all ways of connecting our care with the action we need to make a difference. As we expand our Care, more people will notice and be inspired by what we do. Last week, I described the plight of the pangolin and how these timid, defenseless mammals the size of a house cat are being poached to extinction. In order to care, all we have to do is look at the problem. Look at it and feel how wrong it is that these tragic animals simply don’t stand a chance. Care from the first sphere can be that we don’t like how this kind of poaching makes us feel. Expand that Care farther out and we can start conversations that help others to stop, look at the problem and also feel how wrong it is. ► WHAT DO YOU CARE ABOUT? ► HOW CAN YOU EXPAND YOUR SPHERES OF CARE SO THAT YOUR SERVICE LEADERSHIP GETS STRONGER AND HAS A GREATER IMPACT?